I've been searching google to make paper clay and found that most of good recipe has joint compound in it. Well, I know it's inexpensive but I don't have it at home and I am feeling lazy to go out to DIY store to buy one. Another thing, my 1 gallon Elmer's glue had finished! I only have small tube school PVA glue now. Woohooo....time for experiment! I like my best homemade clay recipe though and that would always be my best choice. But in this situation, I'll make clay with whatever I have in the kitchen. First of all, we need homemade glue. It's very simple to make the glue. I used traditional glue recipe but I cooked it in microwave instead of the stove. Put 1 cup of homemade glue to container. Tear the tissue to small pieces. Don't use scissor because the tissue will dense and not fluffy. Add in 1 tablespoon good lotion or moisturizer. 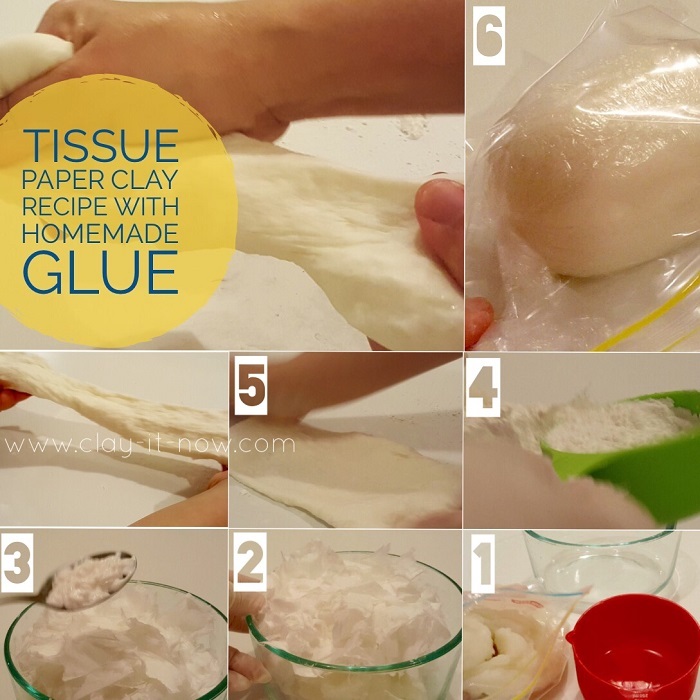 Mix the tissue + glue + lotion and knead well. You can use electric mixer if you want. With mixer, the tissue will be broken down to fine fiber. Slowly add 1/2 cup corn flour/ cornstarch and knead well. Place your tissue paper clay on kitchen bench and knead again for few minutes until you it's really stretchy. Add corn flour if the mixture feels too soft and sticky. To keep the clay, use cling wrap and put it in zipped plastic bag. Keep your glue in the fridge. It can last for few months. If it is too thick, add few drops of hot water to soften the glue. Before keeping the glue in zipped plastic bag, I've added few drops of eucalyptus oil so it will not stick on the plastic and smell fresh. As I prefer to work with fresh clay, make just enough for your project. Hope you like our tissue paper clay recipe. Happy crafting!